INWOOD — As temperatures rose and snow piles began to thaw this weekend, a tempest of trash was uncovered on the sidewalks of one of Upper Manhattan's busiest commercial corridors. While the sidewalks in front of most retail stores on West 207th Street and nearby Broadway were cleared of snow and trash, there were still four chain stores that had piles of brake dust-covered snow, coated with everything from plastic wrappers to glass liquor bottles. "It's disgusting and unhealthy," said Inwood resident Mauricio Varga, 38. Although many mom-and-pop stores in the area had cleared the piles of snow outside their stores, Radio Shack, Chase Bank and two Rite Aid stores, at West 207th Street and Broadway had piles of snow and detritus covering the sidewalk outside their stores. At Radio Shack at 576 West 207th St., a store manager who asked not to be identified said he was aware of the garbage and planned to clean up on Monday, but added the responsibility should not be his. "That's ice," he said of the snow piles outside his store, "I won't be able to get rid of that unless I take a pick to it and I'm not going to do that, I'm just running a business here." Radio Shack's corporate office did not respond to requests for comment. 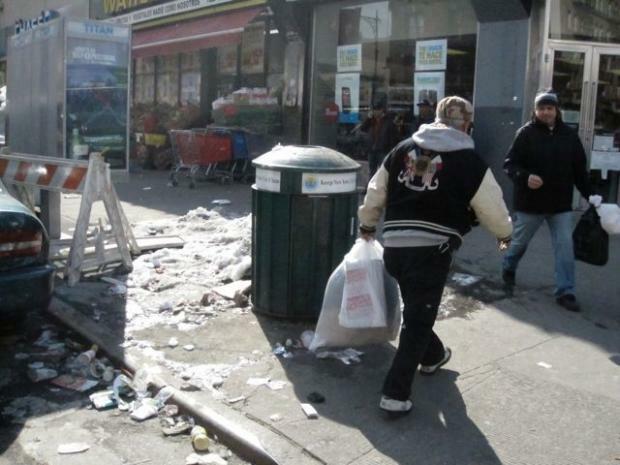 According to the Department of Sanitation, store owners are required to clean their sidewalks or face a $100 fine. The department could not confirm whether any store owners had received tickets. A spokesman for Rite Aid said that the corporation was previously unaware of a problem at their Inwood store, but would attempt to clean the trash from the snow piles immediately. "We really do try to take care of our sidewalks and make sure our stores are as inviting as possible," Rite Aid spokesman Eric Harkreader said, adding that residents concerned with the cleanliness of their locations can call 800-Rite-Aid or file a complaint through its online customer service chat service. Officials from Chase said they were now looking into the issue. Although many residents voiced frustration about the dirty street, some said they thought most businesses were doing the best they could in light of heavy snowfall this winter. "It's been a crazy winter," Inwood resident Mark Ridgewood, 27, said. "I'm surprised they haven't found more than trash under those piles."